Whether you want a smaller grill on your balcony or your backyard deck, the Weber Performer Charcoal Grill, 22-inch model, is just what you’re looking for. With a sleek design and perfect fit for any backyard, this model offers delicious charcoal grilled food every time you go out to cook. 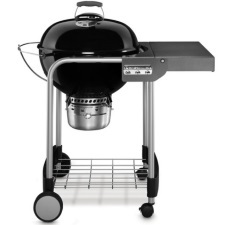 Weber is a name famous in grilling and this new model is no different than the previous supreme performance models. It offers the same Weber dependability and quality that you’ve come to know and trust in the grilling industry. This bowl-shaped grill allows you to cook up your favorite meats and veggies in the tranquility of your own backyard, whenever you’re ready to. One of the things that have to be done whenever you’re cooking with charcoal is getting rid of the ashes. It can be quite a tedious job to do depending on how you will remove them from your charcoal grill. With the new Weber Performer Charcoal Grill, you can do this simple and easy with the removable ash catcher design. It is a sleek addition to the grill itself allowing for easy removal and cleans out of all the ashes from your previous cooking endeavors. Simply remove the high-quality ash pan, dump out the ashes and get ready for more delicious eats! Keeping an eye on the temperature and heat inside the grill is critical to making sure your food is cooking at the proper temperatures. With the new Weber Performer, you can easily keep an eye on when the temperature in the grill is just right with the built-in lid thermometer. You can see when your grill is at the right temperature to put your food on or if the heat is staying consistent to know how much longer to cook your food. This great addition to the grill makes it easy to keep an eye on the cooking process without having to lose heat consistently by opening up the lid. At the time of constructing this review, there were over 137 different customer reviews on Amazon alone. The overall consensus was that the Weber Performer Charcoal Grill, 22-inch, was a great investment for your grilling needs. The grill received a total of 4.7 out of 5 stars by those who have purchased and used the grill. This grill is also an “Amazon’s Choice” product! There were around 14 critical reviews that had some concerns with the Weber grill. They were concerned with items such as the grill being top heavy in a strong wind gust, missing parts when it was shipped, and the side table was not of the durable quality they expected. There were over 123 reviews from customers who highly rated the Weber Performer Grill and shared their love of the product with those interested in buying it. They said things such as … “By far one of the best grills you can get” … “This grill has been terrific” … “Rock solid” … “Great grill, I love it” … “Five stars!”. If you’re looking for a top-quality charcoal grill to fit your smaller backyard patio or balcony area, then the Weber Performer Charcoal Grill, 22-inch, should be at the top of your list. The name Weber is infamous with grilling and providing a top-notch product to all you purchase it. You can easily grill up your favorite dishes in no time to get that delicious charcoal flavor you know and love. Adding this item to your backyard kitchen area will take your BBQ’s to the next level. Consider this unit if you’re in the market for an easy to use, simple to clean grill that will have your family asking for more delicious meals each weekend that you grill.